Although residents of Southern California and other fault-riddled regions may be accustomed to riding out temblors, the latest earth-quake swarm, which struck Imperial County, 100 miles east of San Diego, left residents on edge and caused many people outside of the more common quake ready zones to wonder whether they would be prepared if an earthquake struck their area. More than 300 quakes shook Imperial County in August 2012. Though most were minor, two registered magnitudes of 5.5 and 5.3 large enough to shatter windows, knock trailer homes off their foundations, cause sporadic power outages and gas leaks, and prompt hospital evacuations, reported Maria Peinado, a spokeswoman for the Imperial County Emergency Operations Center. And they impacted nerves. are typically described as “earthquake-heavy” regions to prepare themselves … just in case. Check out these seven simple tips offered by the Federal Emergency Management Association and the United States Geological Survey. To reduce your risk of injury or death, conduct a “hazard hunt” through-out your home, neighborhood, workplace and school before a quake strikes, advises FEMA. Identify and fix hazards like unsecured televisions, computers, bookcases, furniture and unstrapped water heaters. Place breakable or heavier items on lower shelves, put latches on cabinet doors to prevent them from opening during shaking and keep flammable materials in latched cabinets or on lower shelves. Next, inspect your home’s structural stability. Whether you’re a homeowner or renter, take a look at the building’s foundation, roof, chimney, unreinforced masonry, unbraced cripple walls, soft first stories and vulnerable pipes. Speak with a contractor or engineer (or talk with your landlord) to help you identify your building’s weaknesses and begin to fix them as soon as possible. Learn where your electric, gas and water shut-off valves are located, and be sure you and your family members understand how to turn them off in case lines are damaged. Also make certain you have easy access to any tools you’ll need, like a wrench or pry bar, should the valve be stuck or blocked. When a large number of extra people come to a city, it causes the roadways to become flooded with cars. This makes driving conditions even more dangerous than usual. Any time there are that many out-of-town motorists unfamiliar with an area, combined with drivers stressed by the congestion, accidents are bound to happen. Another reason why the roads become a hazard is due to cell phones. There are many vacationers who use their handheld devices to locate restaurants, attractions, or to figure out where they are going, all while driving! Mix this with the thousands of residents who are also just as distracted, and it is a recipe for disaster. The best way to ensure your safety if a major event came to town would be to avoid the roads altogether. Yet if there was no way of getting around driving in these crowded regions, do so with extra caution and heightened awareness. In addition, consider utilizing public transportation and your knowledge of the back roads. Make sure you know where you are going. I know several people who have had trouble because they got lost and ended up in bad neighborhoods. Any time there is a major event bringing a substantial number of people into one area, there is a higher risk of threat. It is crucial residents stand prepared for anything and everything that could occur. The major issue for those who already prepare is that a disaster is reliable in case you need to flee. Also, keep your gas tank filled and a proper car kit inside. Go through your preparedness items to see if any need to be updated (water rotation, out-of-date food products, children’s clothing in BOBs, etc…). Prepare your home in hopes it will be a safe haven if a disaster were to occur. Remember to address the five basics – water, food, shelter, energy and self-defense. If entering a crowded scenario (sporting event, concert, festival, etc…) there are certain precautions to take to help keep you safe. Be careful where you park your car, try and park in a well-lit, busy area. phone) on your body, and not in a separate bag. Wear clothing that does not attract a lot of attention. Don’t flash money around, or wear expensive jewelry. Holt wood would lead us to believe that spies and armed personnel have a sixth sense that alerts them when threats lurk around the corner. Even though they are often used by military, police, rescue teams, and hunters, tactical flashlights have today become so popular in normal day usage. These types of flashlights are powerful and are a good choice for safety. 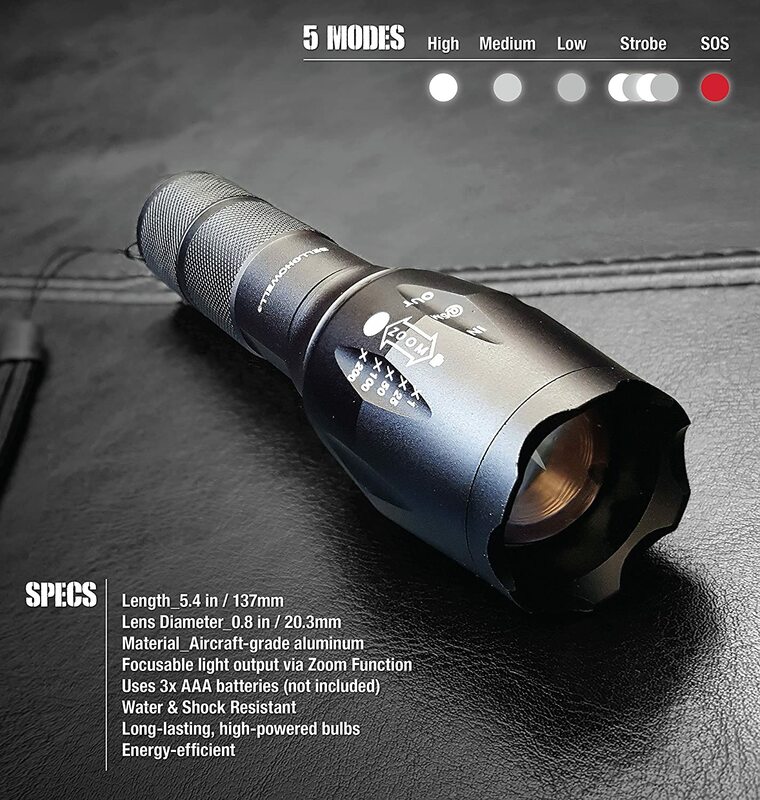 Compared to regular flashlights, tactical flashlights are considered as the best and most effective devices for self-defense and general safety. Tactical flashlights can be carried anywhere as they are highly portable. In this regard, let me introduce to you the Bell + Howell 1176 Taclight High powered tactical flashlight. It is a powerful flashlight made with military grade aluminum material and features very high quality an efficient lighting features. A regular model of this flashlight uses 3 AAA batteries while its upgrade utilizes a rechargeable battery. The bulb in this flashlight can light for up to 100000 hours and the light illuminates up to 2 nautical miles. It is compact,lightweight and to top it all its price in the market is very competitive. 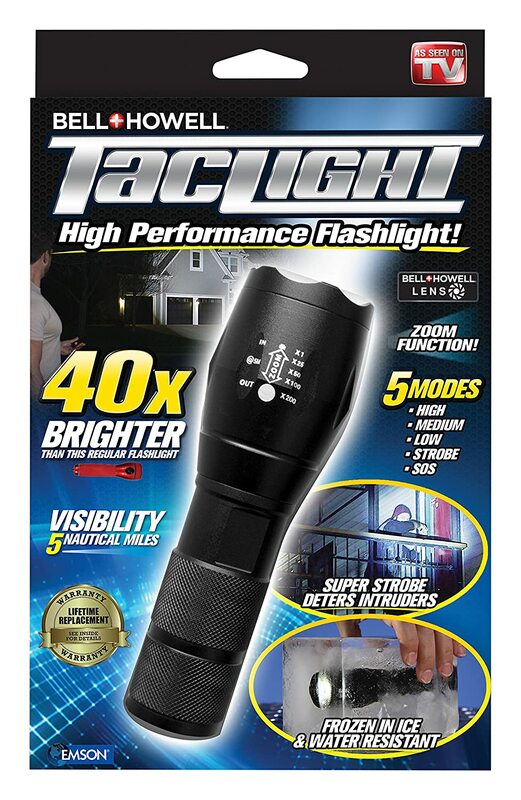 This tactical flashlight by Bell+ Howell is 22 times brighter than regular flashlights. If you want a flashlight that is bright enough to illuminate a wide area and to the darkest points, this particular flashlight has that much power. It produces very powerful lighting than can be seen up to 2nautical miles away. The light produced by the flashlight is about 600 lumens which is much stronger than regular flashlights that provide only 27 lumens. Apart from that, the flashlight also features a variety of mode settings. For example, it has an SOS setting which unless the flashlight is turned off or switched to a different zoom, it continues flashing SOS in Morse code. It has a zoom function that allows you to narrow the light or widen it depending on how you want the light to be illuminated. The low light mode enables you to reduce the illumination to be dimmer if you don’t want too much powerful light. It also has a strobe mode that can be used to stun people or preys when the light is aimed at them. And lastly, the bright mode enables you to shine the flashlight in a high but steady mode. The Bell +Howell 1176 flashlight is made of high-quality military grade aluminum that makes it extremely durable, highly compact and still lightweight. Additionally, the material is waterproof which means that the device can still work even when immersed in water. It also has the ability to withstand extreme temperatures like extreme cold or heat. It is also shock resistant. Buying this flashlight by Bell + Howell provides you with a lifetime guarantee so that when the device develops faults, you can change it quickly and without difficulties. On an unusually cold autumn day, with the sun barely able to breach a low bank of clouds that seemed to hug the skyscrapers downtown, there was an unexpected strangeness in the air, a detached apprehension. Perhaps it was just part of your mission or maybe the unsettling way things were left between you and your fellow operators at the morning’s briefing, but an uneasy anxiety cluttered your thoughts. Walking downtown toward the jewelry district to meet your contact, you sensed a disturbance in the general flow of the foot traffic around you. It was as if something was amiss, but you couldn’t quite put your finger one it. Nerves? Tension? Stress? These have all been a familiar part of your routine in the months leading up to today’s operation, and you’ve gone over these plans, over these very sidewalks, countless times in preparation. Why these feelings today? Your gait was steady, smoothly following the patterns of the people around you. Something was very wrong. Stopping at a gold retailer at the edge of the district, you feigned interest in something in the window; instead, your eyes strain left and right to spot something, anything, out of the ordinary. A woman on the corner, checking her phone. A man in a business suit, waiting for the bus. A homeless guy rooting through the trashcan. Nothing sticks out. Then you see him. Dark glasses, blue light jacket, tan slacks. You saw him three blocks back, crossing the street. He stopped when you stopped. You’re being followed. By whom? Why? Double cross. Abort the mission. Forget the plans. Three months of diplomacies and intricate procedures taught, learned, memorized, down the drain. Yes, abort and extract. Lose the tail, meet at the safe house and find out who the mole is. The first instinct is to keep moving and move quickly. Escape the situation as fast as possible; whoever he is, the bulge under his left arm says he isn’t here to make friends. But instead, slow down, act natural. Initiate the Gray Man. A snap right turn into the parking structure on Olive Street. It’s crowded with morning traffic as the business day has just begun. Through the structure and out onto Mercury Court on the east side. A quick glance tells you he’s still back there, keeping pace and keeping his distance. He stalls at the exit on Mercury Court, as you turn right down the alley between a Thai food place and the LA Diamond Factory. You pick up the stride, darting through merchants and shoppers, barely clipping the shoulder of older man as you bound onto Hill Street. It’s Wednesday. Your destination is Pershing Square on the next block north, a large brick-paved park that plays host to a Farmer’s Market, teeming with people. It’ll be perfect, a nice crowded place to become the Gray Man. It’s the fourth month of the epidemic. The news from your shortwave radio announces that the death toll around the world has reached one billion people. You, your family, some neighbors, and close friends have escaped the worst of it by bugging out to a compound of remote cabins deep in the woods. Besides the 28 of you, you haven’t seen a soul since you left the city. Two weeks ago, your neighbor’s teenage son went missing but turned up three days later with symptoms of the epidemic. It spread quickly through his family before they could be isolated. By the next week, they were dead, along with six others. The remaining survivors don’t seem to be infected, but with death comes bacteria, infection, disease. There are 11 bodies slowly decomposing in one of the cabins that need to be dealt with. It’s time to bring out the dead. But how ? Being exposed to human beings who have died of unnatural causes is not a normal part of the human experience. People with access to hospitals and funeral homes have become unaccustomed to the tasks of handling dead bodies. In a survival situation in which death has occurred, you might have to touch the remains of a human, move them, and perhaps hear the brittle sounds of rigor mortis or of built-up gases escaping. These are not normal situations, and it will take some mental fortification on your part to overcome. Death isn’t pleasant. It will never be pleasant, and you’ll have to prepare yourself for it. In this situation (and many like it), the bodies you will encounter will most likely be damaged in horrific ways. There will be fluids, smells, sounds, and sights that will live with you for a long time. The discovery, removal and burial of these bodies will not be a tidy job, especially if you lack a few of the basic materials, such as gloves, body bags, tarps, etc. Although it might be difficult to restrain your empathy for a once-living person now lying dead before you—especially if he or she was a loved one—there is an important task at hand that must be dealt with quickly and properly. Survival is messy. It is best to get it over with before it gets even messier. You are about to undertake an unpleasant activity. For a variety of mental and physical reasons, this will be difficult. Preparation is key. The better prepared you are for this, the quicker it will get done and the easier it will be. Ideally, you will have particulate masks, latex gloves, and body bags (or large garbage bags) to deal with the remains. This is why these things should be packed in your emergency bags. Crawling up the cold, slanted slab of cement has already gotten old, but this is now home. The crawl space just below the underpass is as good as it gets until you get your feet back on the ground. You push the flap to your tent aside, take a quick glimpse back at the dry riverbed some 60 feet away, wonder how you got here, and then crawl in for the night. It isn’t too far fetched to imagine what life would be like if suddenly—tomorrow or maybe this afternoon—you lost your house, your job, your car, your bank accounts, and almost everything you might have held dear in your life. What then? Where do you go? What do you do? You’re on your own, and you’ve got to do what you can to survive. And it isn’t going to be easy. Given these possibilities, American Survival Guide decided to pound the pavement in Denver and the urban sprawls of the reater Los Angeles area to learn a bit more about some survival methods, both proactive and preventative, that might benefit those to whom such circumstances should befall. There are proven ways to survive within our respective concrete jungles. Obviously, the most important of your basic needs will fall under this category. No matter the situation, a safe, warm, dry place to rest and recoup is a given. You have three aspects to look out for, in terms of setting up a place to sleep: protection from the elements/danger, warmth, and concealment. You also have three options, depending on the situation: You can sleep in a vehicle if you have access to one, you can seek out a homeless shelter, or you can resort to an urban campsite of your own. Vehicle: Obviously, your car or some type of motor vehicle is ideal cover. Should you have access to a vehicle, parking in a Wal-Mart, 24 Hour Fitness, major hotel chain, or any other type of all-night business parking lot is advised—if you are able to get to these locations. Due to these business hours, you’re less likely to have anyone questioning the car or paying you a visit. Your car can, of course, provide you with occasional heat if you need it, as well as power for connective devices such as laptops or cell phones, if you have one. There are many A/C adaptors within the $20 to $40 range, and you would be well served to keep one in your vehicle or bug-out bag, along with your phone charger (which you already probably keep on hand). Sunshades are also advised, because these are not only great for daytime protection, they are ideal for night-time privacy, as well, especially if your vehicle lacks tinted windows. Some of the most contentious debates occur when people start asking questions that begin with, “what one gun … ” or “what one knife … ” and so on. Those kinds of questions get asked, no matter the type of avocation one might pursue, whether it’s about fishing rods or the best all-around lens for photography. For this article, we open things up a bit and discuss not one style—but the top eight styles—of knives for survivalists to have on hand if and when things go sideways in the world. However, a couple of complications arise when we consider that this topic deals with items on which your life may depend, along with the fact that there are a lot of opinions out there that accompany the vast array of available knife styles. But the best answer to the question regarding the best styles of knives to have at the ready will result naturally from looking at our daily lives. You’d be surprised at the number of American kitchens that do not have a good set of kitchen knives—or an effective way to sharpen them. If the world does take a turn for the worse or something catastrophic happens, we’re not going to have easy access to takeout or microwave dinners. There will actually be more meal preparation taking place as we harvest our gardens and procure game. I didn’t have a good set of kitchen knives until about two years ago. I never gave them a second thought and just used what I had on hand for what little meal prep I did. Nevertheless, they are a useful addition, whether you’re bugging in or taking the show on the road in a long-term survival scenario. Whether you’re carving meat, chopping and dicing vegetables, or slicing a fresh loaf of bread you’ve just baked, a quality set of kitchen knives will be required when KFC is no longer an option. Yes—I’m going from one extreme to the other. A machete is an extremely versatile tool for easily clearing vegetation, doing light chopping on saplings, and cutting away overhead vines—whether you’re at home clearing out some light brush or bugging out on foot. It can be used to build a shelter or to dispatch a chicken for Sunday dinner. In many countries, the machete is used for just about all cutting and chopping needs and is a definite must-have blade for a survivalist of any kind. If you’re not prepared, winter can kill you. Make a mistake in the wilds in June and you may have a long night ahead with a great story to tell your friends, but make the same mistake in January, and you may lose some fingers or toes and possibly your life. The first rule of winter travel is to respect the season. Read along to find out how to battle freezing temperatures and win. When selecting clothing, avoid 100 percent cotton at all costs due to its poor insulating value when wet and its inability to wick moisture away from the body. Many hikers who “die of exposure” in the wilds are often wearing cotton (“cotton kills” was coined for a reason). Instead, select items made of poly/cotton, nylon/cotton, fleece, wool, or silk. Most of my clothing is wool and was found for pennies (and practically brand new) at second- hand or army-surplus stores. For the first layer, I wear a long-sleeved shirt of silk, merino wool or polypropylene. For the second layer, I don a turtleneck followed by a wool button-up style shirt. Depending on my activity level and the out-side temps, the remaining layers are a heavyweight wool or fleece sweater, followed by a parka or down jacket. Strive for two to five layers here. One thing I do, regardless of the season, is to stow a spark rod firestarter in each of my jackets along with a vial of cottonballs smeared with Vaseline. Fire is life in the wilds, especially during the brutal months of winter. Choose Army surplus or Filson wool pants for one layer. For another, bring lightweight polypropylene or silk long-underwear. Nylon windbreaker pants are also helpful, but the weave of my Army surplus wool pants is so tight they are windproof. Make sure you have one or two pairs of heavy socks from fabrics such as Smartwool or Ragwool. Avoid cotton or athletic “tube” socks as they don’t wick moisture away from the skin and can cause severe blisters. Take one pair of insulated boots with removable wool liners. The most common winter pac boots available for wet, slushy conditions are Sorel Pac-boots. These are clunky and cumbersome but perfect for those times when you are not moving around much. On occasion when hunting, I will wear Thinsulate boots if the temps are above freezing and the ground conditions are not wet. For the finest cold-weather footwear available, when the temperature drops below 20 degrees, Steger Mukluks are my first choice. These are based upon the traditional footwear of the Polar regions and their ultralight design makes them ideal for trekking and snowshoeing. For serious winter, you’ll need a heavy wool or mad bomber-style hat. For milder weather, a wool hat will suffice, but when temps dip below zero, an insulated mad bomber hat will keep that survival tool between your ears operational.